This free eBook will help you master the learning of Android App Development in Android Studio and it's absolutely free for subscriber. Android App can be developed in many languages (like JAVA, C, C++, Scala etc) but the most popular out of them is JAVA. Though it is not true but you can consider JAVA is the official language to create Android App since it’s most commonly used. So the first thing you need to learn before starting Android App development is to have good knowledge of JAVA and specially OOPs concept. In this section we discuss XML basic, layouts, widgets, views, attributes and lots more with practical examples. 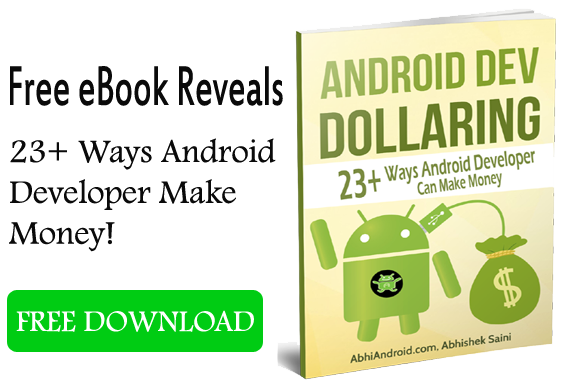 Learning android programming is both fun and can generate huge profit in the long run. As of July 2015, Statista revealed Google play is the largest mobile App store which has over 1.6 million Apps and billions of application gets downloaded every year. If you knows android programming, not only will you be having a stable and sound career but can unleash your hidden talents as a developer. In this section you will get into the depth of technical stuff used in Android App Development. Now I know to create first few real world Android App in Android Studio is difficult no matter how much theory you have learned. By keeping that in mind AbhiAndroid is happy to introduce this category where we will share step by step tutorial for creating real world Android App from scratch in Android Studio. Beginners in Android are going to love this. Material Design is a visual language developed by Google which was first introduced with Lollipop OS and since then it has become popular in designing and developing Android Apps. As per Google this language is based on paper and ink. In this section you will learn how to design beautiful and user friendly Application using Android Material Design. All our tutorial will have at least 1 practical example and step by step explanation of each topic. We hate SPAM and promise to keep your email address safe. You can unsubscribe anytime. This free eBook will help you master the learning of Android App Development in Android Studio and it's absolutely free for subscriber! Get Above All 4 eBooks! Your privacy is protected and you can unsubscribe any time.